My son Tom is visiting me at the moment. It’s not the best time of year for a holiday in Korea with the rainy season having dragged on for longer than is usual and with the dry days being hot enough to make you want to dodge from one air-conditioned building to another. Still, you have to be somewhere and I understand that the weather in Teesside isn’t too clever at the moment either. Like me, he is happy enough to watch football in most conditions and so we decided to take in Suwon City’s game with Mokpo in the National League. For those that don’t know, the National League is the second of the three divisions. Suwon City are actually the reigning champions, defending their title because there is currently no promotion and relegation. There is speculation that the match-fixing scandal will change this and that from next season it will be four-up and four-down between the top two divisions. That strikes me as an unneccessarily large step for what are currently leagues of sixteen and fourteen teams respectively. It will be interesting to see what happens if one of the clubs owned by a large corporation ends up in the bottom four. 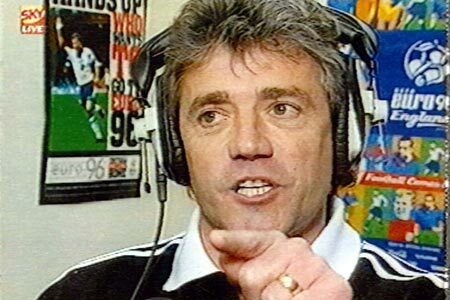 I’d expect that some West Ham style cheating from the Korean FA will take place to allow the status quo to be maintained. 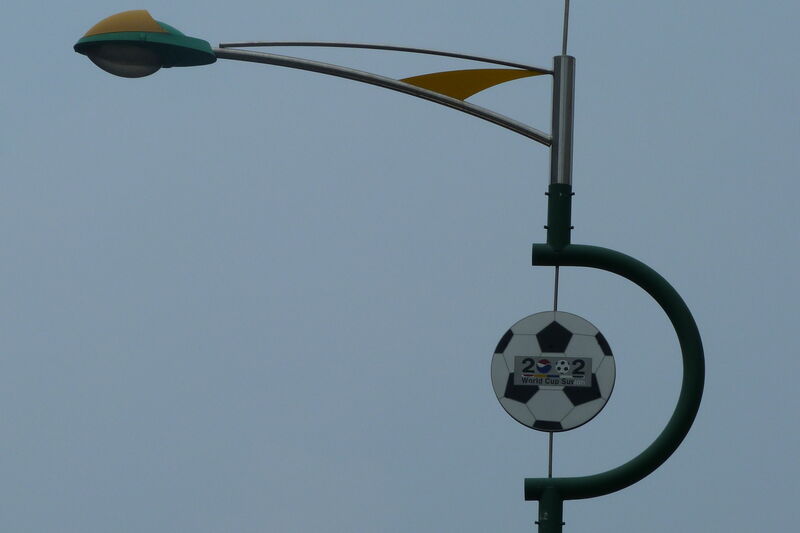 It took us quite a while to work out where Suwon City play their games. Googling them or looking on various websites gives different venues. According to the source, they either play at the Suwon Civil Stadium, or the nearby Kyunngi-Seat stadium, or the practice pitch next to the Suwon Big Bird World Cup Stadium. In the end we gambled on the practice pitch but we got Jen to write down the names of the other grounds in Korean just in case we had to made a tour of Suwon by taxi. Getting the bus is far quicker than doing the whole journey by tube and there is a stop right next to the Bluewings stadium. We stayed on board though and went a bit further into town in search of some air-conditioned lunch. Tom didn’t seem too keen on still-wriggling squid legs or a few silkworm pupae, so we had a pizza and then wandered back up towards the Big Bird stadium. There were signs along the road that appeared to date from the 2002 World Cup. Korea is developing at such a pace that I was surprised to see them and I doubt that they will still be there in five years time. This way to the Big Bird. We had a look around the outside of the Suwon World Cup Stadium. Tom was pretty impressed by the open-air exercise equipment, speculating that it would be quickly weighed in for scrap value in the UK. The practice pitch is shown on the maps of the area near the main stadium and so it wasn’t too difficult to find. There was a single stand, a running track and a couple of tents for the players to get changed in. 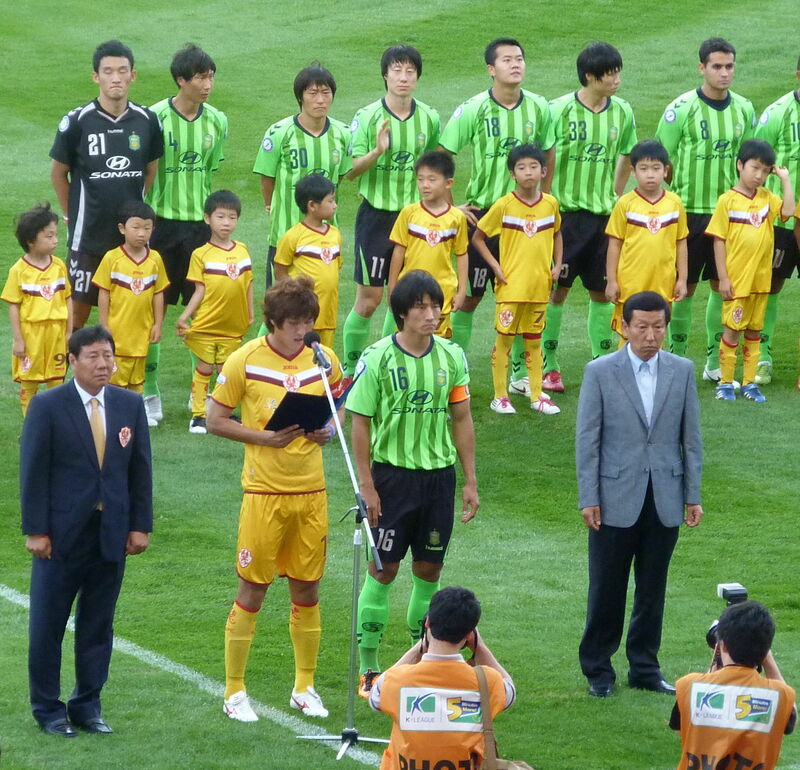 The players were led out a good fifteen minutes before the kick-off time. They have to be, there is that much for them to do these days. They were presented to some old bloke out of the crowd, they posed for photos with the mascots, kicked footballs in to the stand and as has become compulsory stood with one hand in the air and made a solemn promise only to take bribes if it’s definitely worth their while. "We promise not to spend our bribes on hookers and fast cars"
There were probably two hundred or so people in the stand including what looked like a couple of kid’s football teams. It’s a free afternoon out after all, albeit one without air-conditioning. 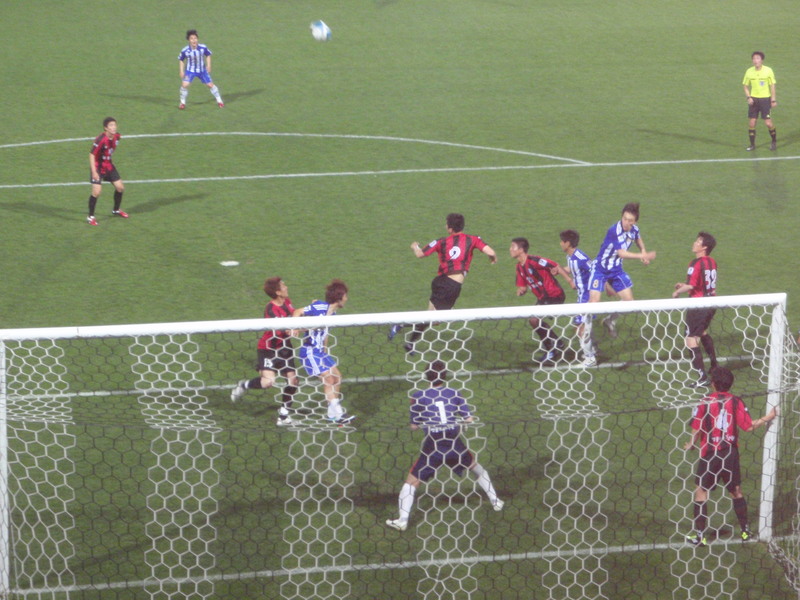 Suwon were in red and blue stripes with red shorts whilst Mokpo wore blue shirts and white shorts. 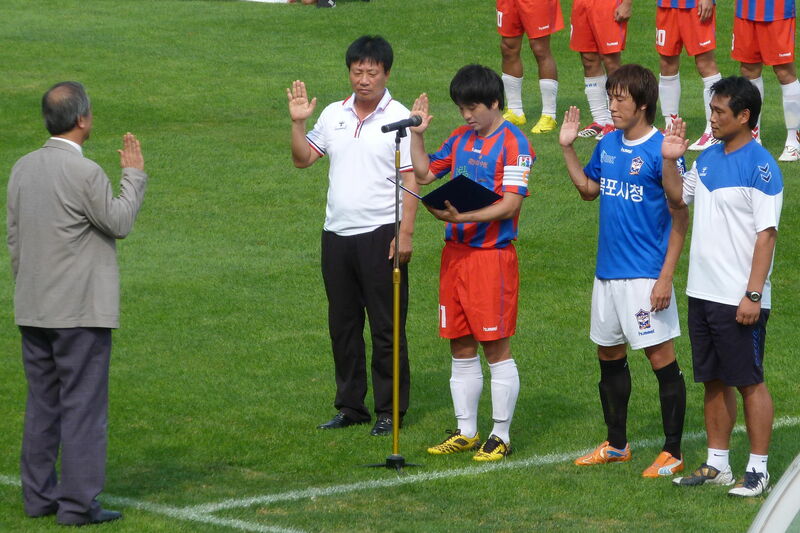 The Mokpo players looked a lot taller overall than their Suwon counterparts. Away keeper Cho Sang Won must have been at least 6’4“ and he had a couple of ugly looking centre halves of a similar height in front of him. I doubted that Suwon would have much joy at set pieces. View towards the main stand. Actually, it's the only stand. I was wrong of course. Twenty odd minutes in a Suwon corner was flicked on and then scrambled home from about three yards. 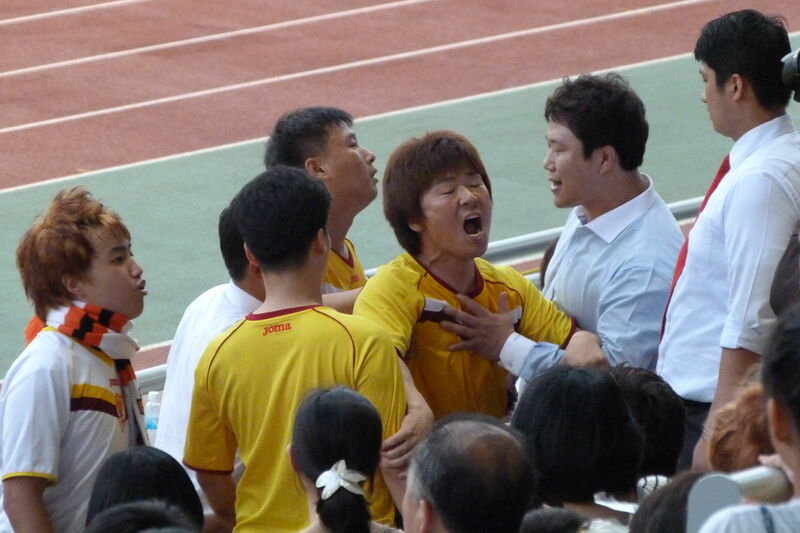 The Mokpo coach was sat a few feet away from us in the stand and he wasn’t too pleased. The football in general was quite poor with players going to ground easily, misplaced passes and little movement off the ball. There were plenty of niggling fouls too that disrupted any flow that might have developed. At the interval the subs warmed up on the pitch and it looked as if each side had nine or ten of them, which seems a little excessive to me. Although I’ve no idea how much, if anything, players at this level earn. If you aren’t paying them anything then I don’t suppose it costs much more to have an extra few bodies on the bench. 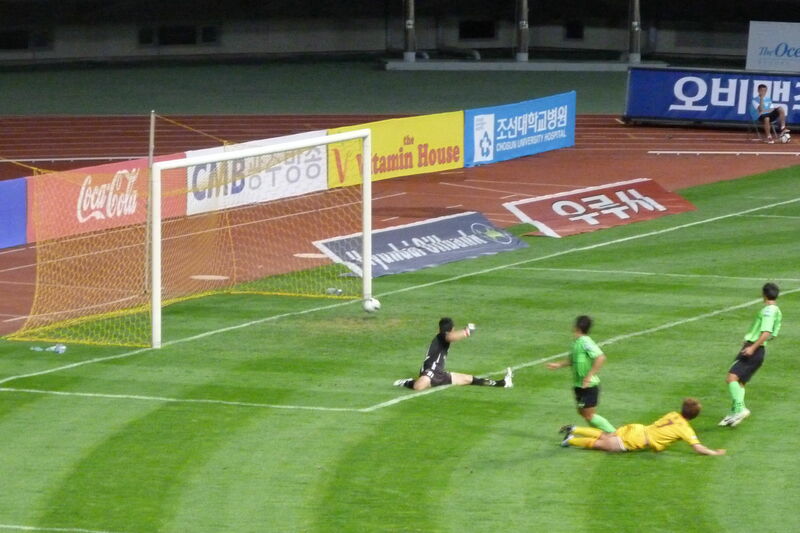 In the second half we got more of the same, the highlight being a well deserved equaliser from Mokpo’s Hong Deok Jong. 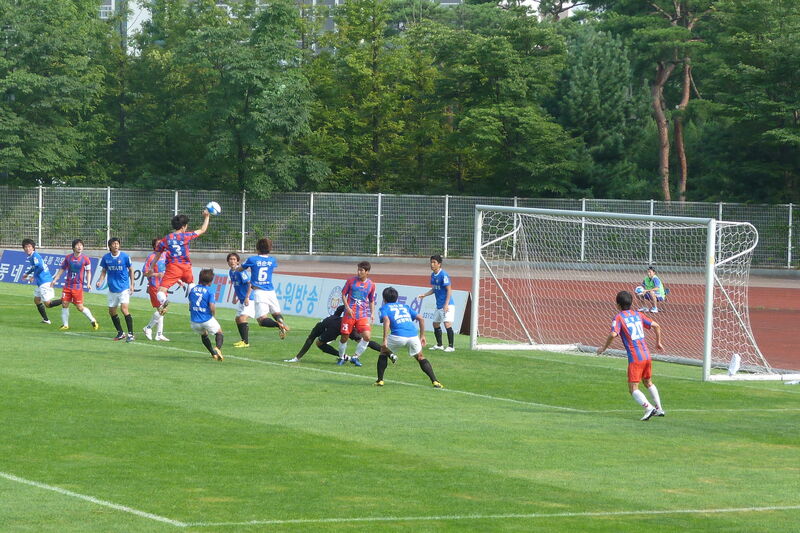 The Suwon goalie got his fingers to the shot from the edge of the box but it was too well placed to keep out. A Suwon defender wellies it upfield. The game finished one each with the point not being enough to move Mokpo off the foot of the table whilst Suwon remained on course for the end of season play-offs. A new team was added to the K-League this season, Gwangju FC. Their inclusion took the number of teams in the top division up to sixteen and had the benefit not only of increasing each club’s league fixtures to thirty but also of removing the problem of someone having a blank weekend due to the odd number of clubs. 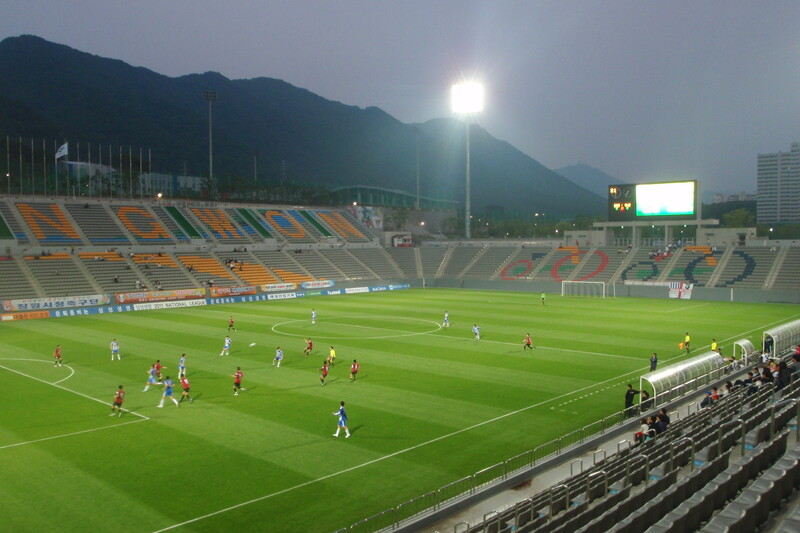 Up until the end of last season the army team played in Gwangju as Gwangju Sangmu. 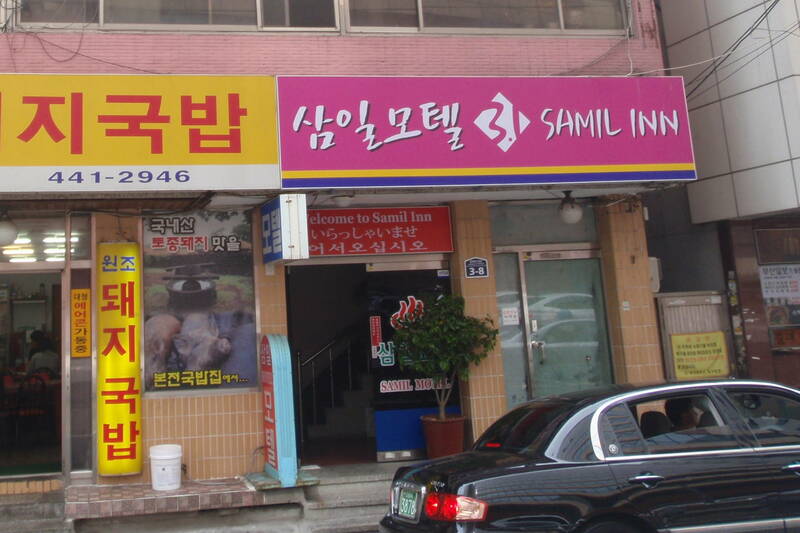 They’ve moved to Sangju now though and as you might have guessed have been renamed as Sangju Sangmu. 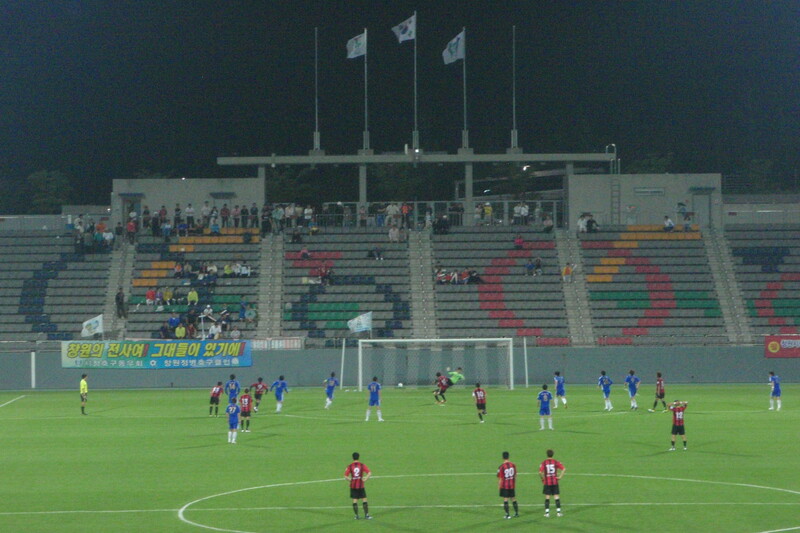 Their relocation meant that the Guus Hiddink Stadium no longer had a tenant and so Gwangju FC was formed and they moved in quicker than squatters in the rain. I’ve been to Gwangju a few times, including seeing Gwangju Sangmu play in the Guus Hiddink Stadium, but as I haven’t yet seen the new Gwangju team I thought I’d better pay the place another visit. Jen and I caught the KTX from a drizzling Yongsan on the Friday evening. It takes about three hours to get to Gwangju and it made a nice surprise to find that we’d gone beyond the rain clouds. We turned right out of the station and just picked the first hotel that we came to. Complete with spires, towers and stuff. 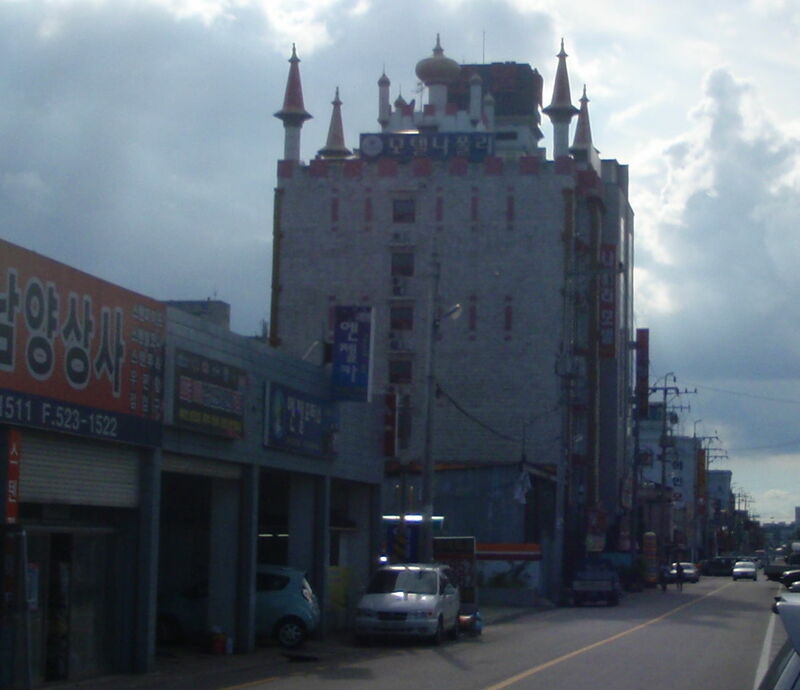 It was good value at thirty thousand won a night with air conditioning, a large fan and, as advertised outside, a 42″ telly. We didn’t watch too much tv, but we certainly got full value out of the air conditioning as it ran all night on the ‘ Just like the inside of a fridge’ setting. I suspect that if we’d stayed there longer than a couple of nights then we might have bankrupted the hotel and created an energy shortage across the country. 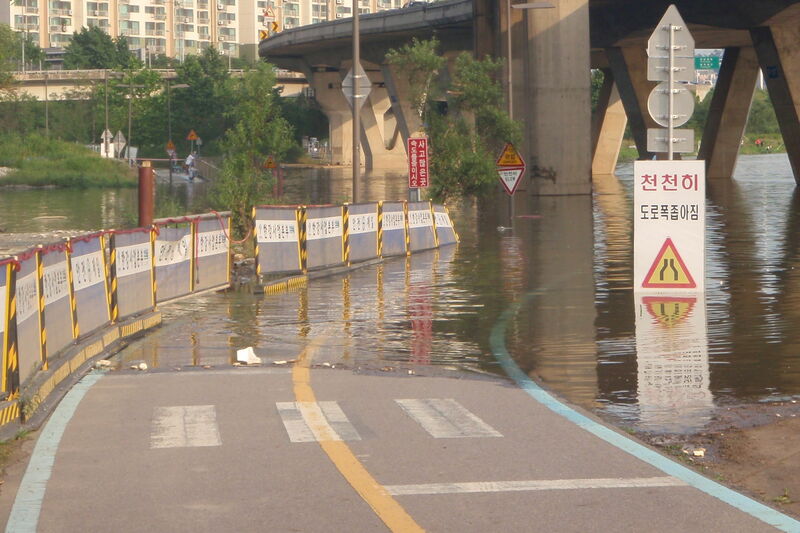 It still wasn’t raining when we woke up, which is an unusual state of affairs for Korea at the moment. We couldn’t waste a dry day and so got a taxi to the nearby Wonhyosa Temple in Mudeung Provincial Park. It only took twenty minutes and even with a bit extra added on to the meter price in compensation for the lack of a return fare it was still under fifteen thousand won. The various trails were reasonably well signposted, but we still managed to take the wrong route initially and had to retrace our steps. There was plenty of wildlife to see though, including chipmunks, frogs and a dog with pink ears. There are packs of them, running wild. 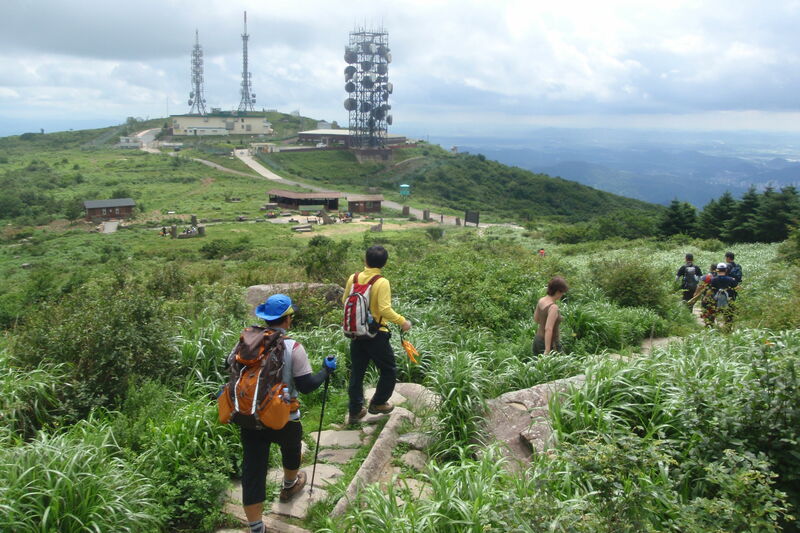 There are a few peaks higher than a thousand metres in the Mudeung Provincial Park, although not all of them are accessible. We walked for about six hours in total, covering sixteen kilometres or so. The peak at Seoseokdae looked to be blocked off but we got as far as the 1,100m Ipseokdae rocks on Mudeungsan after stopping off for a while at a temple on the way up to Jangbuljae. After getting back to where we’d started from at about quarter past four we were fortunate enough to be able to quicken our stride and catch the bus just as it was about to leave. It wound around town for a while but still had us back to Gwangju Station within forty minutes. 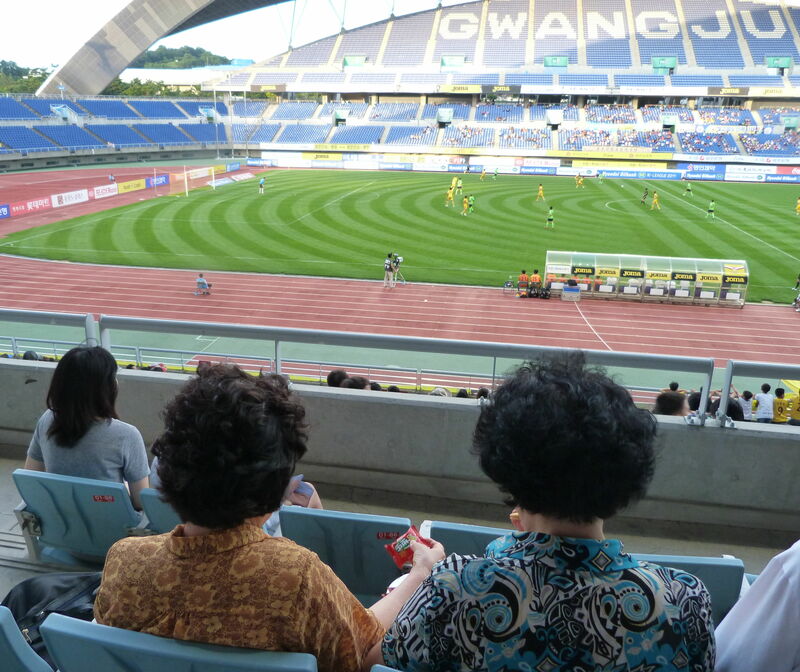 Gwangju’s home game with Lee Dong Gook’s Jeonbuk Motors was due to start at seven o’clock and by the time we’d got changed and taken a taxi there was only half an hour to go until kick-off. We got a couple of tickets at ten thousand won apiece and were given a free bottle of water and can of Sprite each as we went in. We had tickets for the West Stand, but as they didn’t have any turnstiles open we had to enter via the North and make our way around. Lee Dong Gook was starting up front for Jeonbuk, with the Brazilians Luiz Henrique and Eninho in attacking midfield roles. We got the “No, nay, never, no nay never no more, will I play the fixed odds, no never no more” speech from the captains before the start again. I wonder how long that is going to have to go on for. "I think I'll have the chicken and chips please"
In the first half most of the action took place off the pitch. The home fans unfurled a banner after ten minutes or so that had the stewards scurrying over to remove it. There was a bit of scuffling as both sides fought over the banner, with the fans heavily outnumbering the stewards. Eventually though the banner came down. Fifteen minutes later it all got a bit livelier as around forty of the fans behind the goal made their way around to the main stand and started shouting at the club officials. A few of them were pretty angry and this led to fans from the main stand remonstrating with them. It all got a bit heated with a few punches thrown. There wasn’t a copper in sight though and as more of them arrived the stewards could do little to disperse them. After ten minutes or so the ringleader decided it was time to take his army of teenagers and social misfits back behind the goal. They received plenty of abuse on their way back from some of the older fans, but seemed quite pleased with their little adventure. I find it all a bit sad that people can get worked up at a football match to a level of rage that turns to physical violence, particularly over a team that hadn’t even existed five months previously. Nothing of note happened in a goalless first half and at the interval Jeonbuk took off their two Brazilians, replacing them with Kim Dong Chan and Krunoslav Lovrek. The substitutions didn’t have the desired effect though and it was Gwangju who took the lead ten minutes into the second half with Lee Seung Ki sliding the ball home at the far post. Gwangju didn’t hold on to their lead for long though and a few minutes later a cross from the left took a deflection off home defender Kim Su Beom for a scrappy equaliser. We didn’t get any more protests and we didn’t get any more goals. The draw took Jeonbuk four points clear at the top of the table, ahead of second placed Pohang Steelers who had lost at home to Chunnam Dragons. Going to the match, any match, is quite difficult in Korea at the moment. The rainy season is scuppering the baseball and in what seems to me to be really inconsiderate timing the second and third division football teams are on their holidays. Despite starting and finishing their seasons at roughly the same time as the K-League, the teams in the National and Challengers leagues knock off to the beach for six and eight weeks respectively in the summer. So what does that leave? Not much really. I think if the weather had been better then I’d probably have looked to get up a mountain somewhere. Ice hockey would be the perfect solution. An arena with the air conditioning set cold enough to stop ice from melting? That sounds just about perfect. But, no, it’s a winter sport so I’ll have to wait until the weather is just as cold outside as inside and it doesn’t seem anything like as attractive in those circumstances. Sometimes though, something crops up that makes a particular game irresistible, and that was the case with the Sangju Sangmu’s visit to Seoul. South Korean football is going through a crisis at the moment with around a hundred top-flight players under investigation for match-fixing or gambling on their own games. So far, forty odd have been indicted, with ten being banned for life and one getting ten months in chokey. More players are being lifted each day, with most clubs being affected either through having taken part in a fixed game or by having subsequently signed a player who did. However, even amongst misery you can usually find a positive and this week it came from Sangju Sangmu. The military team is one of those teams most involved, with fifteen of its players either under investigation or already banned. Three of those players ruled out are goalkeepers, leaving them with just last season’s Jeonbuk keeper Kwon Soon Tae. Now, when you are the only remaining goalie on the books, you’d be careful wouldn’t you? You’d keep your fingers away from the bacon slicer or dogs with large teeth. You’d probably try not to strain your back whilst reaching for the remote control for your telly as David James once managed to do, or to sever a tendon in your foot by dropping a jar of salad cream on it in the way that another former England goalie, Dave Beasant, once did. Kwon Soon Tae was able to keep himself out of his local Accident and Emergency department, but he just couldn’t resist picking up two yellow cards and an early bath in the game against Daejeon. This meant that not only did an outfield player have to take over in goal for the remainder of that game, but Kwon’s one match suspension would ensure that an outfield player had to start between the sticks in the following game away to Seoul. That’s some silver lining to the match-fixing scandal. I love it when an outfield player has to go in goal. Really love it, as Wor Kev might say. And so there was no way I was going to be anywhere else on Saturday evening than the World Cup stadium to see some hapless bloke with his gloves on the wrong hands getting smacked in the chops with a football. "I'd love it if Lee Yoon Eui had to dress up as a goalie and flap his arms around, just love it." Just in case an outfield player in goal wasn’t enough excitement for one day, Jen and I decided to walk to the stadium from our apartment in Yeoksam. It’s fourteen kilometres as the crow flies apparently. Not that the way a crow would get there is particularly relevant as we decided to make it a bit more interesting by setting off in the opposite direction and walking to the Olympic Stadium first before joining the Han river. It took the distance up to something around twenty kilometres. Or at least it would have done if the river hadn’t been swollen by the recent rain. Whole sections of path were under water and we frequently had to detour through apartment complexes, over bridges or under roads. 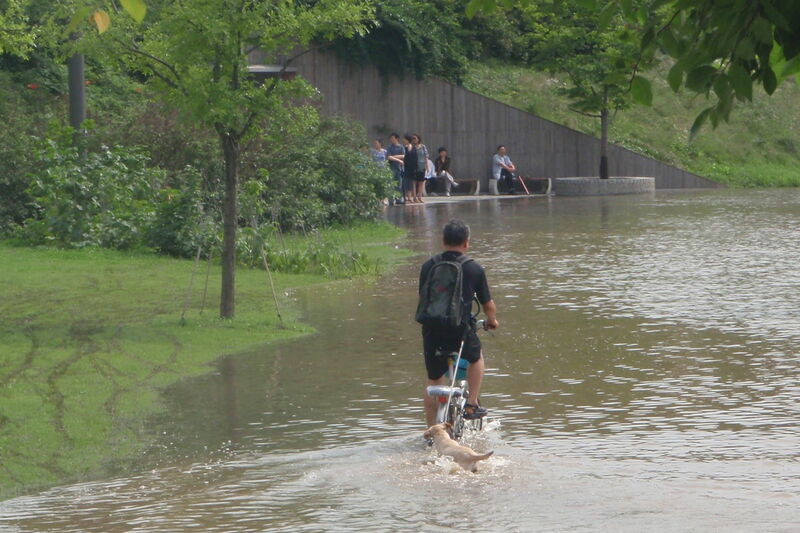 This fella was determined to exercise his dog. More than once we encountered a dead-end and had to retrace our steps before realising that a twenty minute trek had moved us no more than a hundred yards further along the path. At half past six we came up against one blockage too many and after five hours of walking called it a day. We still had six kilometres to do, but didn’t want to risk missing a single moment of comedy goalkeeping. We'd had enough by this time. It was as difficult to get into the stadium as it had been to walk to it. We wanted to sit in the away fans section behind the goal, but the woman in the ticket office told us that it was sold out. As if. I’d have been more likely to have believed her if she had tried to claim that her dog had eaten all of the tickets. 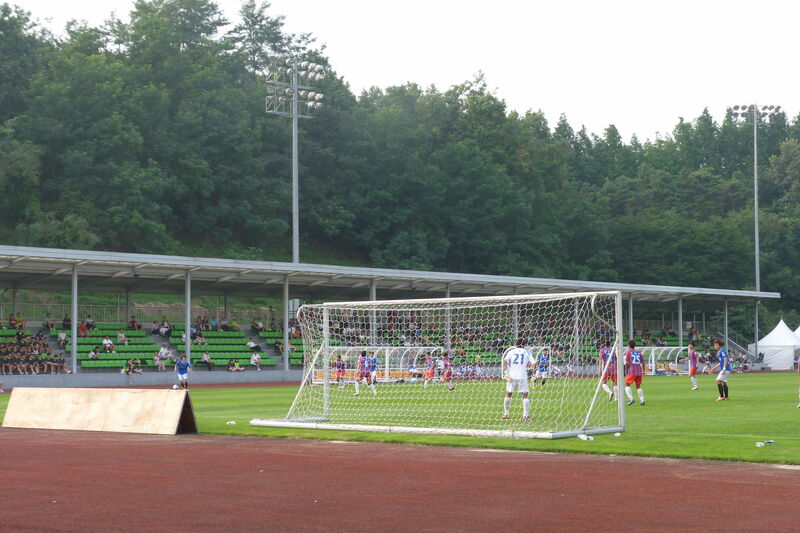 There are around twelve thousand seats behind that goal, probably enough for the entire town of Sangju to attend the game if they fancied it. Eventually she stopped her nonsense and sold us two tickets. As expected there were no more than a hundred away fans in total. Lee Yoon Eui was the unlucky outfield player who was going to play in goal. To make it even more interesting he was making his league debut. His only previous professional appearance had been a twenty five minute run-out as a substitute in a League Cup game against Busan earlier this season. Still, it’s better than digging foxholes or firing at innocent passenger planes that you have mistaken for North Korean fighter jets. 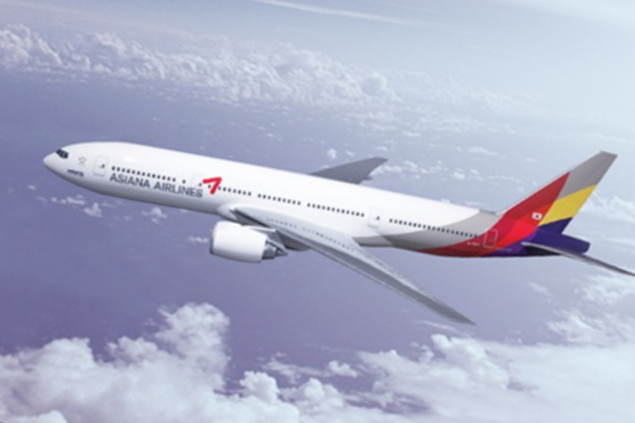 Look out, it's a North Korean fighter plane. In the pre-match warm-up, Lee didn’t look as if he had ever seen a football before. The goalie coach threw a few easy balls for him to catch, but the concept of jumping in the air and collecting the ball at the highest point possible was something that Lee looked to be struggling with. They moved on to a bit of shooting practice and perhaps not understanding what he was meant to do, the debutant keeper successfully avoided almost every shot that came in his direction. Maybe it was his military training kicking in. 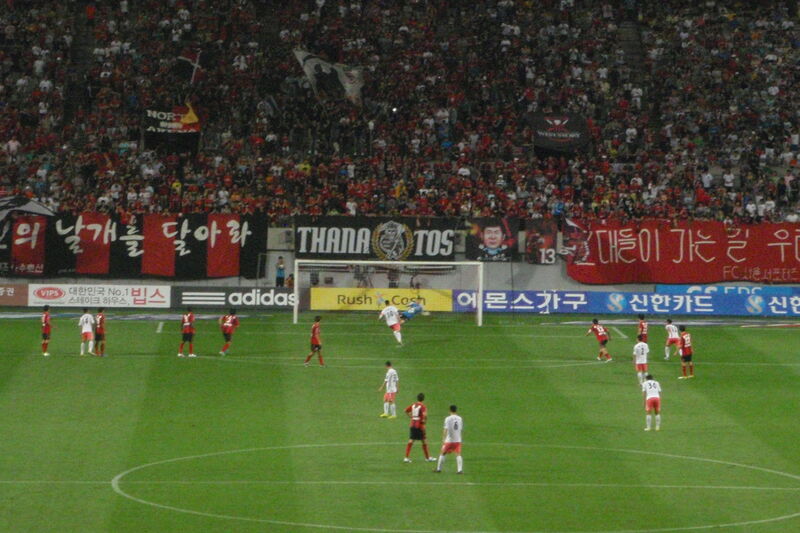 By the time the teams had completed the warm-up I was fully expecting a ten goal or more victory for Seoul. Prior to kick off, the players stood in line whilst the captains each made a short speech, the gist of it being, I think, that they would only bet on the horses from now on and that they wouldn’t take much in the way of bribes until the fuss had died down a bit. Once the game kicked off, I’d been expecting Seoul to be shooting on sight. They didn’t though and it was ten minutes before Lee had to make a save. Even then, it was a fairly tame effort straight at him. We had more of the same for the first half hour with the Seoul players obviously not realising that all they had to do was to place the ball a yard wide of the keeper. Maybe they had taken advantage of the generous odds and backed a nil-nil draw. Lee grew in confidence and started coming for and collecting crosses in a way that he didn’t look capable of doing in the warm-up. His kicking was good too, as you would expect, and for a while it was as if the game was being played with two proper keepers. 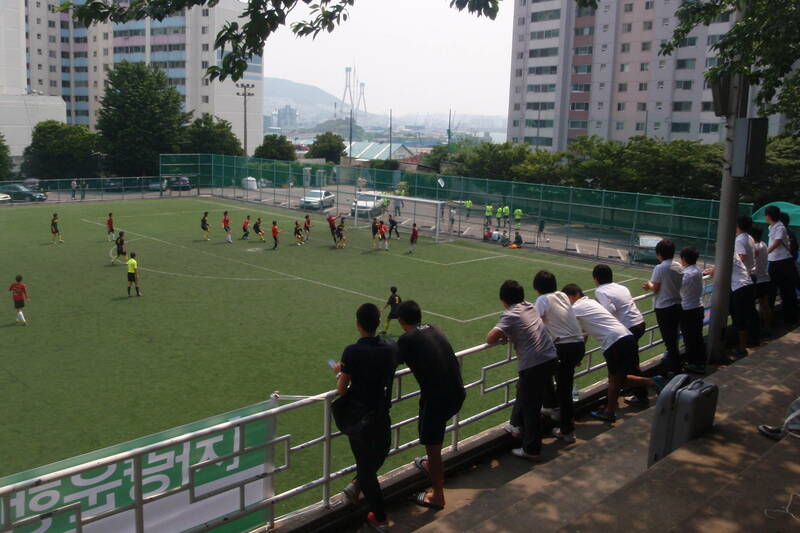 Half an hour in, veteran Seoul defender Edilson gave away a penalty and Sangju had the chance to take the lead. Kim Jung Woo took the spot kick and put the visitors a goal up with the sort of casual chip that would have resulted in him doing guard duty all week had it been saved. Sangju saw out the rest of the half with some decent defending and a little luck as they survived a goalmouth scramble or two. I couldn’t believe how reluctant Seoul had been to pepper the Sangju goal with shots. The second half began with a bit of excitement as Lee gave away a free-kick by picking up a backpass. Again Seoul seemed to think that they were facing Gordon Banks and failed to grasp that just hitting the target would probably have been enough. Ten minutes into the half, Seoul finally made the breakthrough. Lee Yoon Eui got caught in no man’s land, something which as a soldier you would think he would be trained to avoid. Dejan Damjanovic was able to slide the ball past him and off the post into the net. Maybe the goal gave the Montenegrin a bit of confidence as ten minutes later he scored his second of the evening. This time it was with a shot from the edge of the box that Lee dived over in the manner of someone trying to make as big a splash as possible by bellyflopping into a swimming pool. As there were still twenty five minutes remaining I fully expected a few more goals. 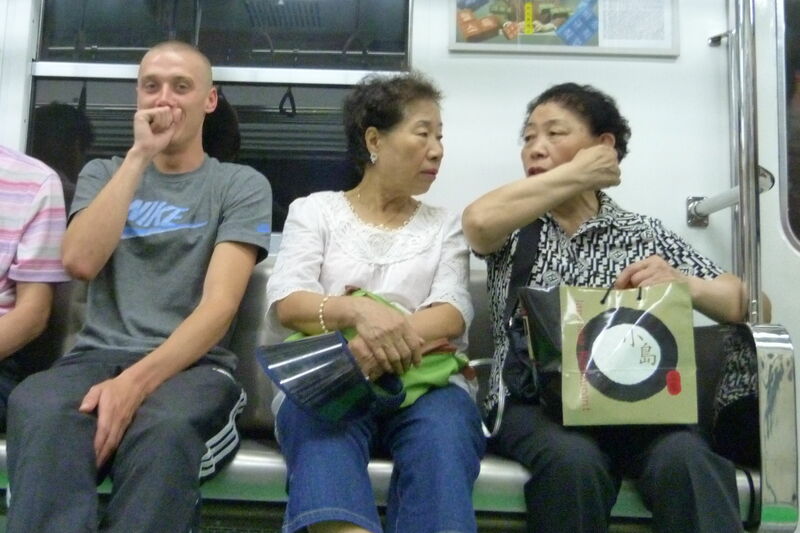 Lee had been found out and all Seoul had to do was hit shots that required him to dive. They didn’t though and seemed content to sit back on their lead. Ten minutes from the end their complacency backfired as Kim Min Soo curled a direct free kick over the Seoul wall to level the scores. That’s the way it should have stayed too. However, the ref added five minutes of injury time and with seconds to go Bang Seung Hwan got the winner for the Seoul after heading home a corner from a couple of yards out. It was the sort of cross that a proper keeper would have just plucked out of the air. Unfortunately Sangju didn’t have a proper keeper and it cost them the point, possibly all three if you considered the earlier errors. 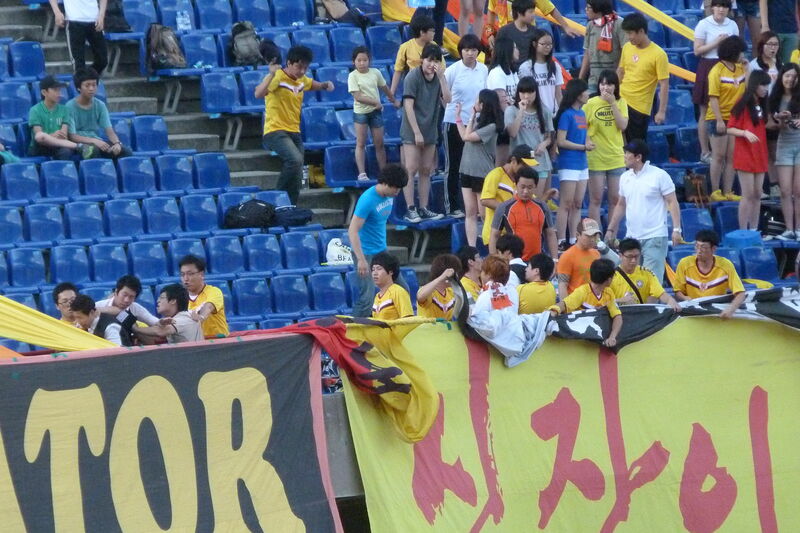 In the circumstances, Sangju and their fans didn’t seem too down-hearted. It was a game that they expected nothing from and that’s exactly what they got. I’d been hoping for some comedy goalkeeping and in the end I got what I’d been expecting too. 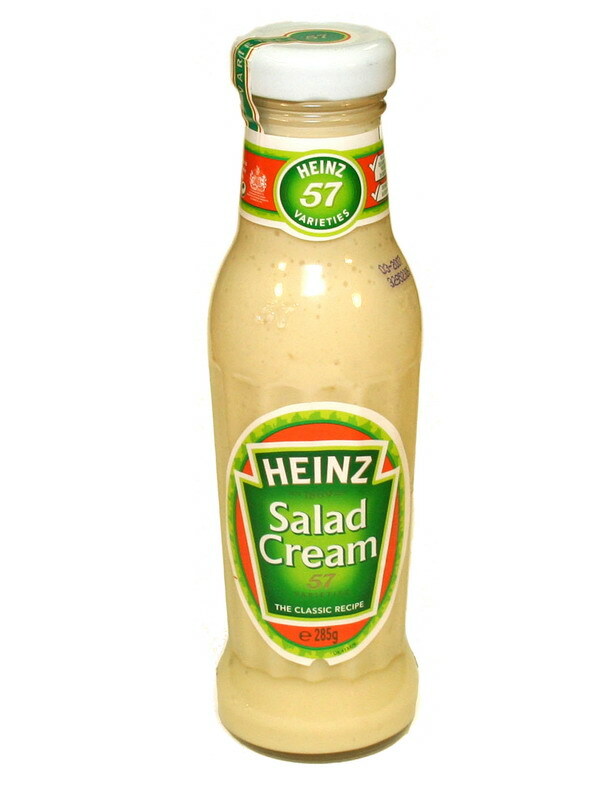 Providing he can keep a tight grip on the salad cream, Kwon Soon Tae will be back between the posts in the next game for the military team and Lee Yoon Eui can go back to spending his Saturday afternoons weeding the parade ground. It’s been more than five weeks since I’ve been to a baseball game due to a combination of holiday, rain and sell-out crowds. I don’t mind missing games if it’s because I’m back in the UK but when games are rained off more often than they take place then it gets a bit frustrating. On one of the occasions when the weather didn’t intervene Jen and I wandered down to the Jamsil stadium only to find the game sold out. Yes, really sold out. There weren’t even any touts with tickets. It’s rare that I’ve ever not got into a game that I’d wanted to, even cup finals. In fact, the only time I can remember walking away from a stadium whilst the match went on without me is a French football game from about ten years ago. 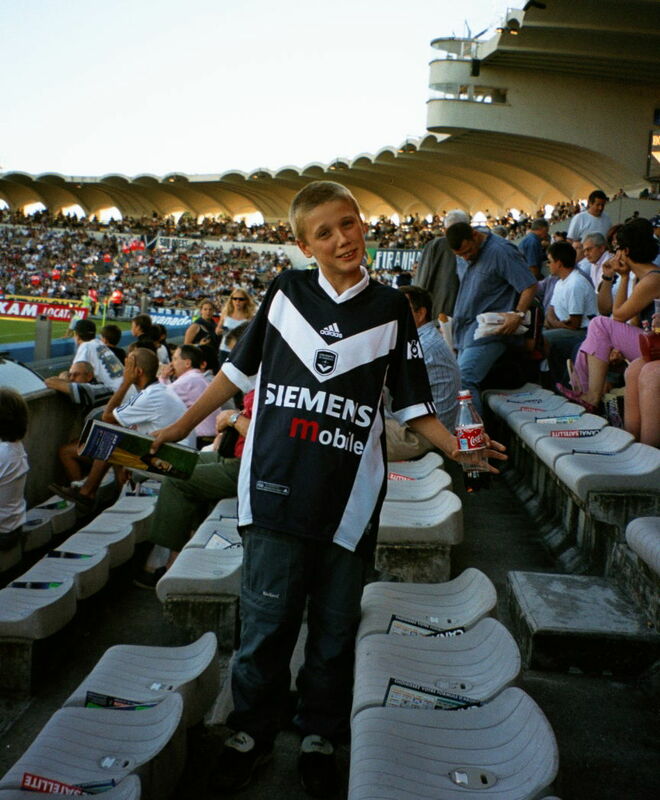 My son Tom and I had been camping near Bayonne and had driven up to Bordeaux to see their game with Paris Saint Germain. We’d done the same a year earlier and watched Dugarry run the show for the home team. Little did I know then that the Frenchman would score against the Boro for Birmingham a couple of years afterwards or that former Middlesbrough player Andy Todd would have one of the most memorable days of his Blackburn career by getting sent off for booting Dugarry up the arse. Welcome to England Christophe. This time though the star attraction was to be one of the visiting players, a young Brazilian called Ronaldinho. The area around the stadium was a lot busier than it had been the previous year and, as with the recent baseball game, there wasn’t a tout to be seen. 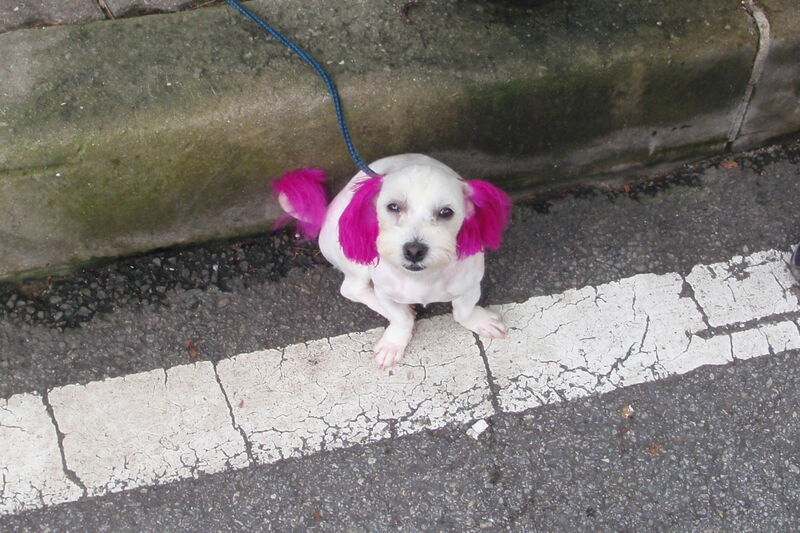 We hung around for twenty minutes until the streets were deserted and then drove back to Bayonne. As the game ended goalless and Ronaldhino missed the game through injury, it wasn’t too much of a disappointment in hindsight. The weather was fine last Tuesday though and after a weekend of rain I just wanted to get out of the apartment and see a bit of sport. I didn’t want to chance another sell-out so I got the subway and was outside the Jamsil stadium no more than ten minutes after the start of the game. I spotted a tout and as I wasn’t in the mood for arseing about I took a seat in the main stand off him for twenty thousand won. That’s around twice face value and about twelve quid. It’s only once every five weeks though. 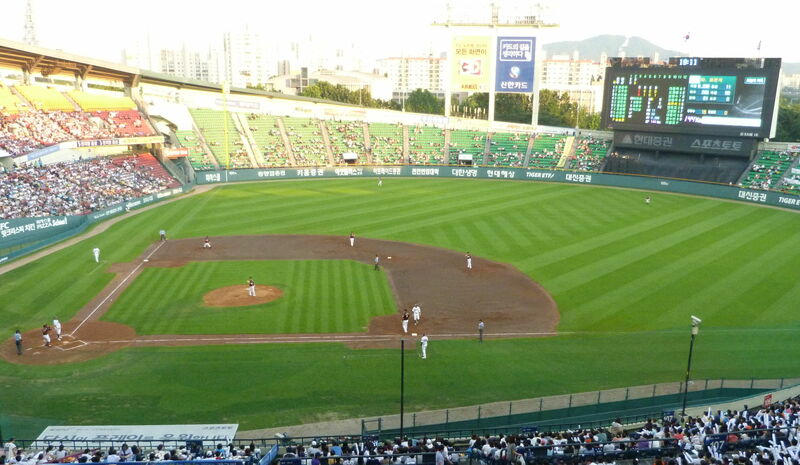 Doosan Bears, who were entertaining Lotte Giants, haven’t been having the best of seasons. They have recently moved up into fifth position, just behind local rivals LG Twins in the last of the play-off spots. Lotte Giants have been having a worse time though and look likely to be off on their holidays the day after the regular season finishes. I took my seat up in the main stand with the opening Doosan innings eight balls old and with two players out. To make matters worse for them Lotte already had two runs on the board. 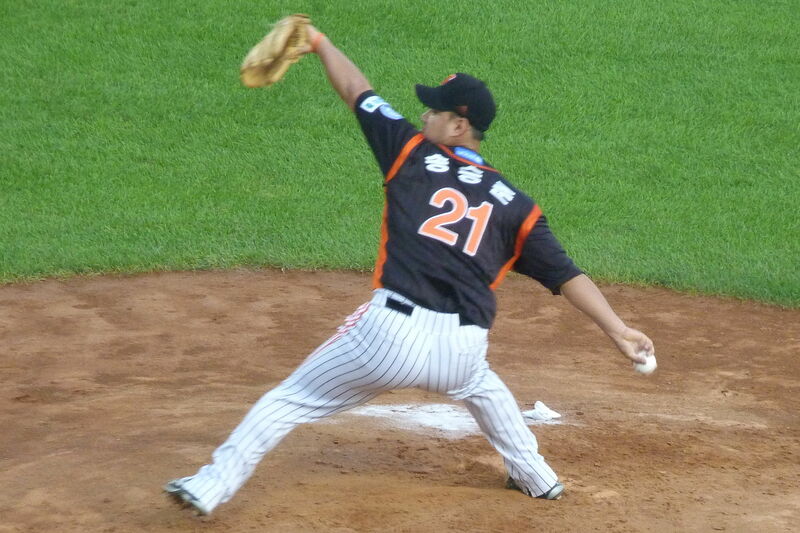 Song Seung Joon was pitching for the Giants and it didn’t take him long to bring the Bears first innings to a close. Things got a bit better for the Bears when it was their turn to bat again. 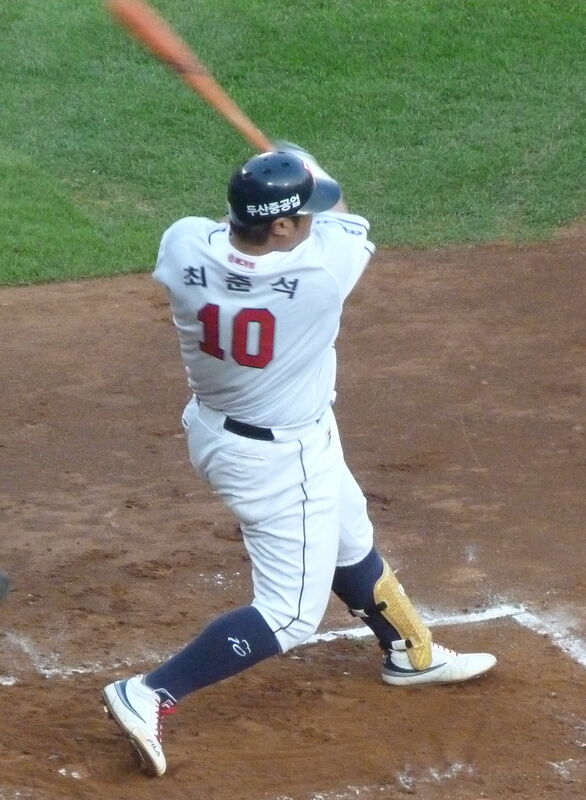 Choi Joon Seok just missed out on a home run when he managed to hit the wall below the scoreboard. It was enough to get him to second base though and it allowed Kim Dong Joo to get home and pull a run back. Kim Dong Joo is pretty popular with the home fans. It’s his fourteenth season with the Bears though so it’s not too surprising. 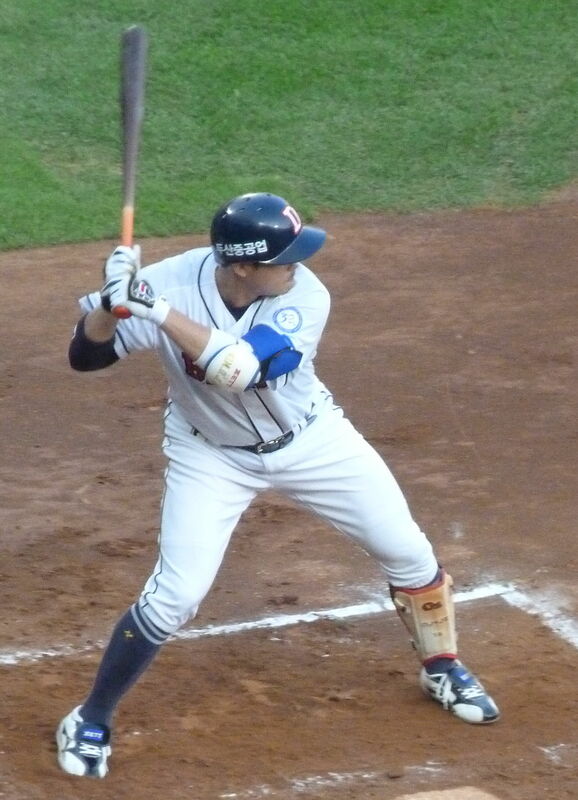 He’s been a part of the South Korean baseball team for a while too, with gold medals from a few Asian Games and one from the Beijing Olympics. A couple of minutes later Choi Joon Seok got his reward for the big hit by scurrying home to level the score. He’s a popular fella too with the home fans, possibly I imagine because of his unathletic frame as much as his big hitting. 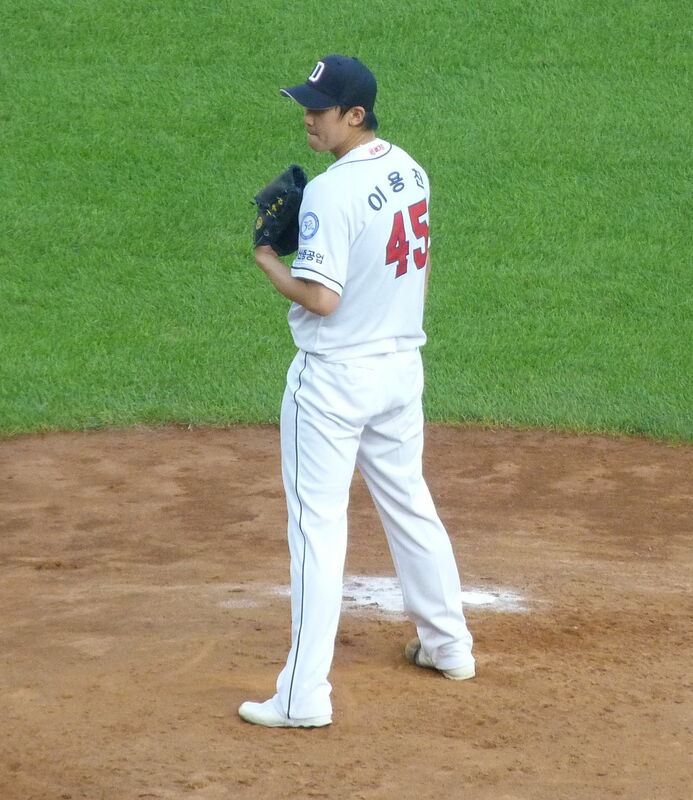 The scores remained level until the fifth when the starting pitcher for the Bears Lee Yong Chan gave up his third run. Another followed in the sixth innings and that was the end of him. He’s a pitcher who is normally used to close a game so I suspect that he was probably worn out by then. 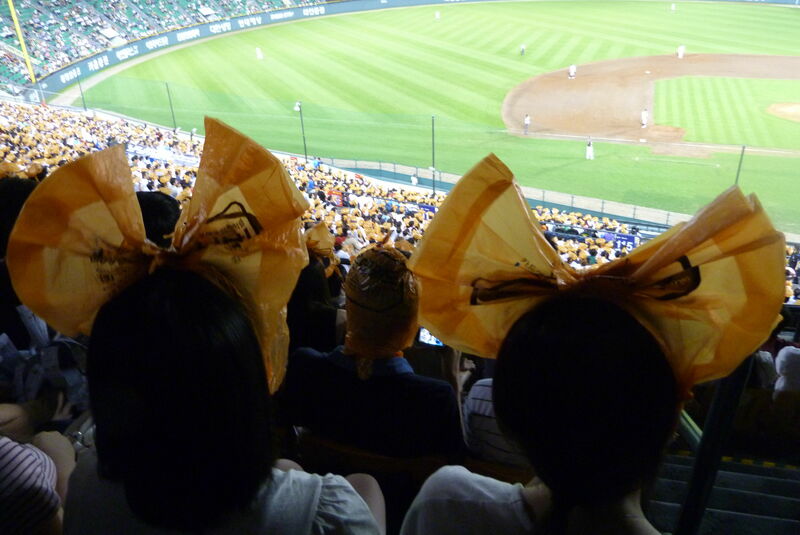 By this stage of the game the Lotte fans had got their orange supermarket bags out and were brightening up the stadium by wearing them on their heads. There’s a new fashion this year though, as a lot of women, mainly women anyway, have taken to twisting the bag to form a pair of what I presume would described in the style magazines and on the Paris catwalks as ‘Plastic bag bat ears’. It's how the cool kids are wearing them this season. And for those of you interested in the singing rather than the fashion, I can report that the Lotte fans still direct that old favourite ‘Shut Up Boy’ at the rival fans, whilst I’m pretty sure that a couple of the other chants were ‘We Hate Ramyun, and ‘Walnuts and Peanuts’. 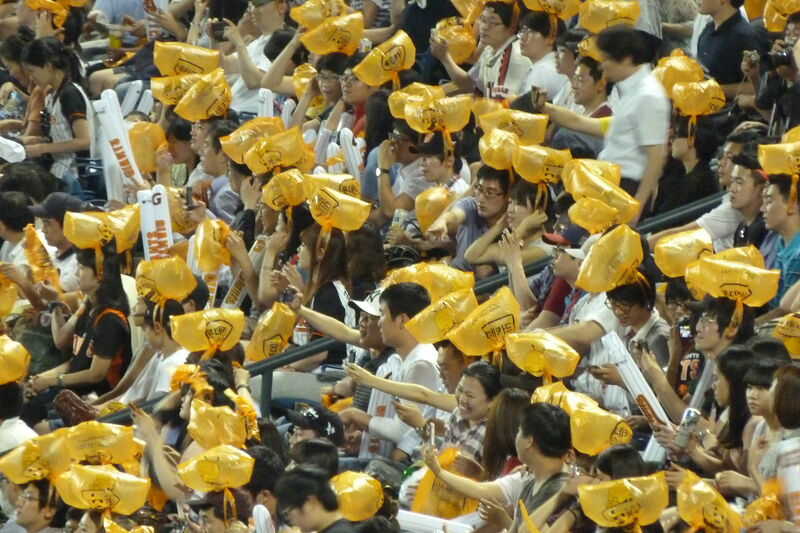 The vocal support paid off for Lotte as their team added another couple of runs in the eight to win the game 6-2. The main reason that I write this blog is so that I don’t forget stuff that I’ve done. Or rather, so that when I have forgotten stuff that I’ve done, I can read back through the posts and refresh my memory. I find that I’ve generally got about a week to get the write-up done before I start to forget all but the most basic details though. After a fortnight I can usually recall that I’ve been to a particular city and watched a football game, whilst after three weeks I usually remember very little more than the fact that I’ve got an outstanding blog post to do. Outstanding that is in terms of it not being done, rather than as a gauge of its potential quality. So, a month ago Jen and I went to Busan again. It’s taken me this long to write about it mainly because I had some time back in England between now and then and I got sidetracked by my other life, the one that involves kids, parents, a bit of hiking and wild camping in The Lakes and almost as much hiking but with not quite so wild camping at Glastonbury. 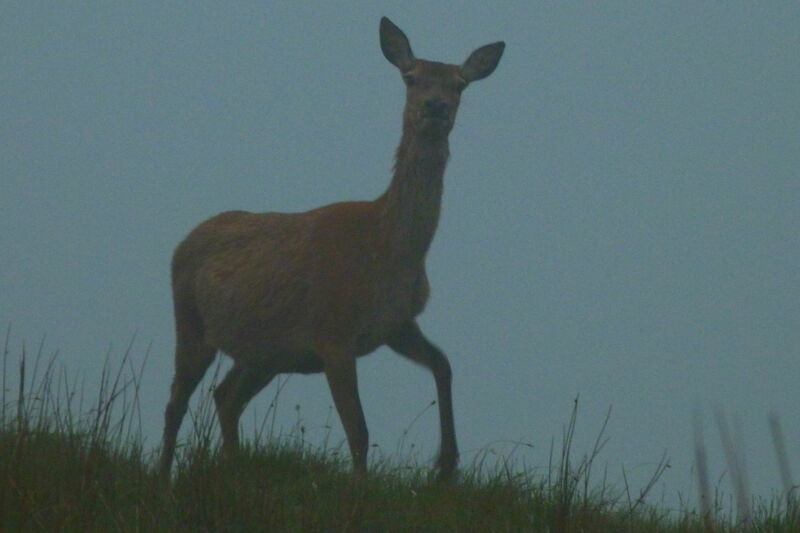 I saw this fella at 6am near Angle Tarn. 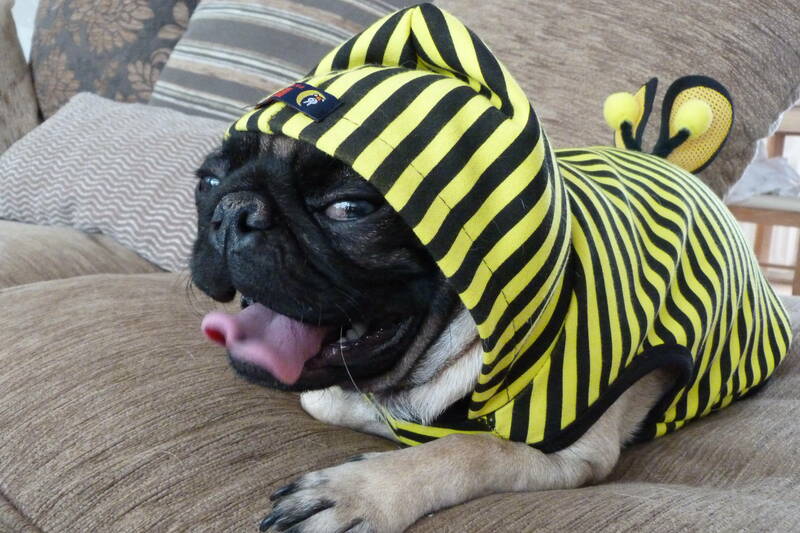 As excuses go for not updating the blog it’s better than ‘the dog ate my homework’, although not as good as ‘I idled away my time in the UK photographing my daughter’s pug dressed up as a bee’. I’m back in Korea now though and a rainy Sunday afternoon seems the perfect time to try to remember what went on at the last match. Here goes. We got the train to Busan on the Friday evening, that bit’s easy. I suspect we probably shared a couple of bottles of screw-top red wine too. We got knocked back from the first hotel we tried, just outside the station, as although they had rooms, they didn’t have one for all three nights of the bank holiday weekend. Fortunately we got fixed up around the corner in a scruffy looking hotel that had probably got its prices right at thirty thousand won a night. Oddly, it's not mentioned in the guide books. Rather than rattle on about the entire weekend, I’ll just give you what I’ll describe as highlights but in reality are actually the bits that I’ve remembered. I’ll finish off with the football game, so just scroll down to the bottom of the page if you’ve been desperately waiting for over a month to find out the score. Jen had some sort of teaching conference thing going on, I’m not sure if she was attending, presenting or both. I do listen when she tells me stuff, but retaining the information for a month was always going to be unlikely. Anyway, all it meant was that I had a bit of time to kill. The first day I occupied myself by watching a succession of schoolkids games in a tournament at the university where whatever it was she was doing was going on. That was ok, particularly as I was working my way through a few bottles of New Zealand beer. A pleasant way to spend a couple of hours. The next day I met up with fellow Boro fan Alan and his wife Se Young. 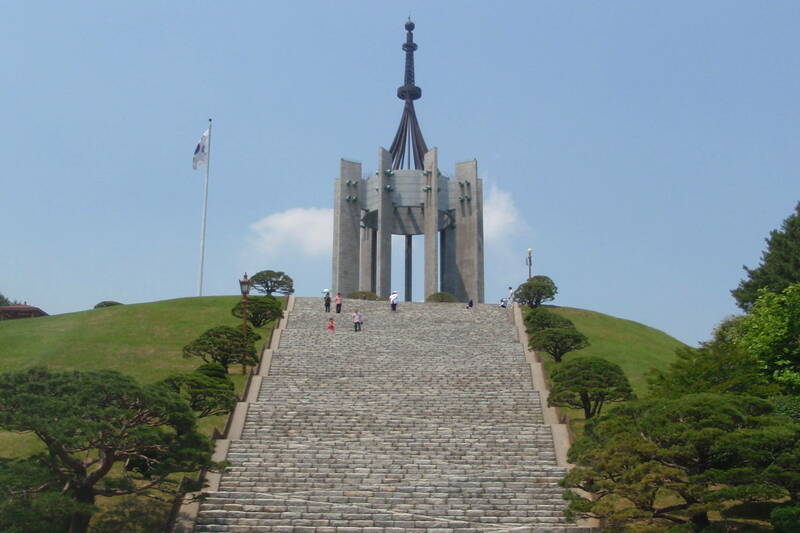 They had the great idea of visiting the Memorial for the War Dead in Jungang Park. It’s quite a trek up to the monument but we went most of the way by bus which in the heat is probably the best way of doing it. 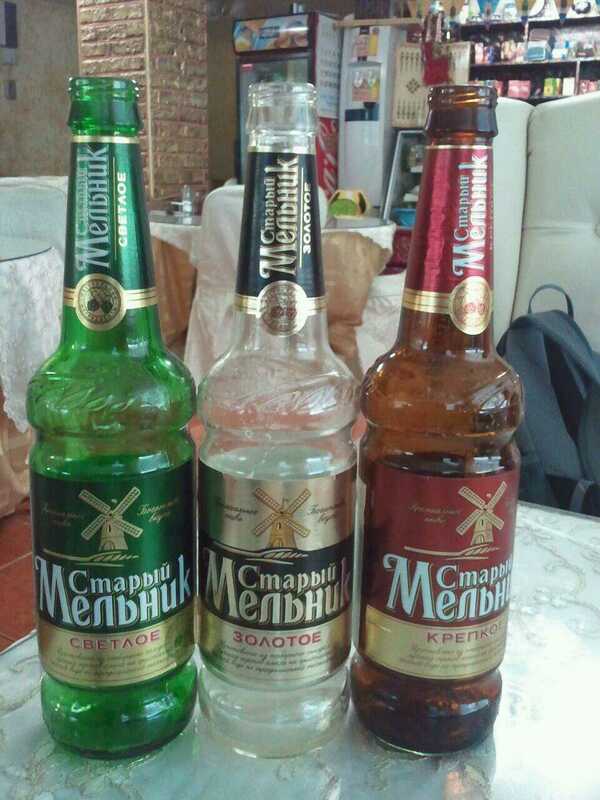 After that they took me to a Uzbekistani restaurant where we overdosed on lamb dishes and worked our way through a variety of different strength Russian beers. It was so good that Jen and I went there later that evening after she‘d finished the teacher stuff and then we returned once more the following evening before we caught our train back to Seoul. The lamb was ok too. On the bank holiday Monday, Memorial Day, we had a bit of a wander around Amnan Park and then along a coastal footpath to Songdo Beach. Busan’s beaches tend to be very popular, particularly the ones further East, Gwangalli Beach and Haeundae Beach. Songdo was much quieter though and a lot better for it I thought. 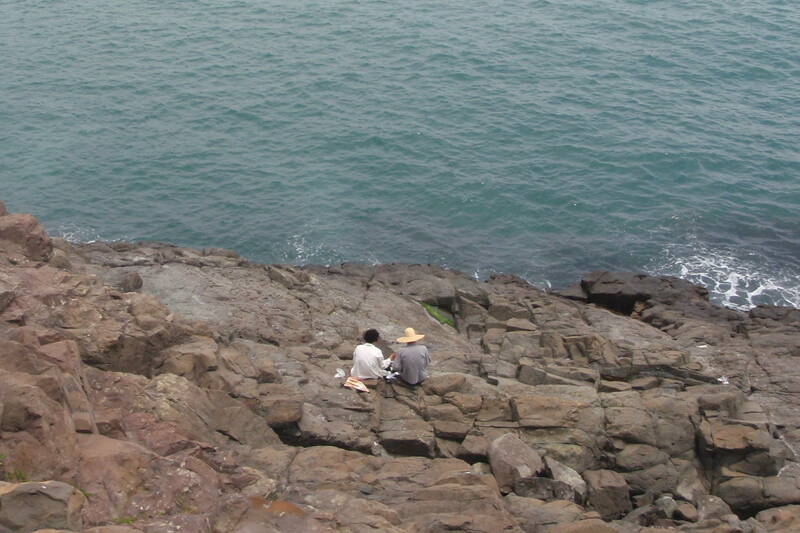 There were plenty of areas to fish and next time I’m in Busan I’d like to have a go. Jen and I enjoying a picnic lunch. So, the match. Or rather some of the match As you may have noticed it wasn’t actually in Busan, but about half an hour’s drive away in neighbouring Changwon. Alan had very kindly offered to drive us all there and had I followed his directions on where to meet we would have seen it all. Unfortunately I went to the wrong subway station and we didn’t get to the Changwon Football Centre until about ten minutes before half time. Changwon break towards the Busan end. We made our way around to the away supporters section as I know a few of the lads who were sat there and I worked my way through a few more of the New Zealand beers. I can‘t actually remember if anything of note happened in the remainder of the first half, but it was scoreless at the interval. 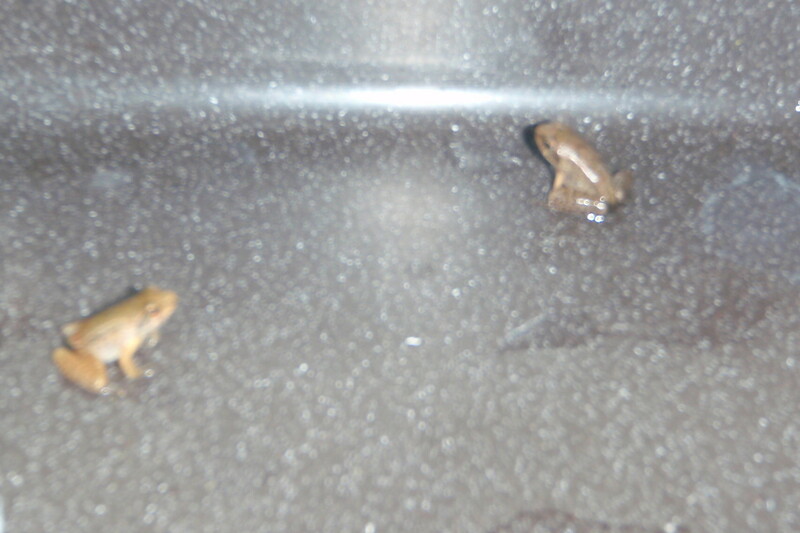 It’s strange how some things do stick in your mind though and the frogs in the toilets is one of those things. I’ve no idea how or why, but that’s like lots of things in life. Obviously I took a photo. Deer, pugs and frogs. What more could you want in a football blog? 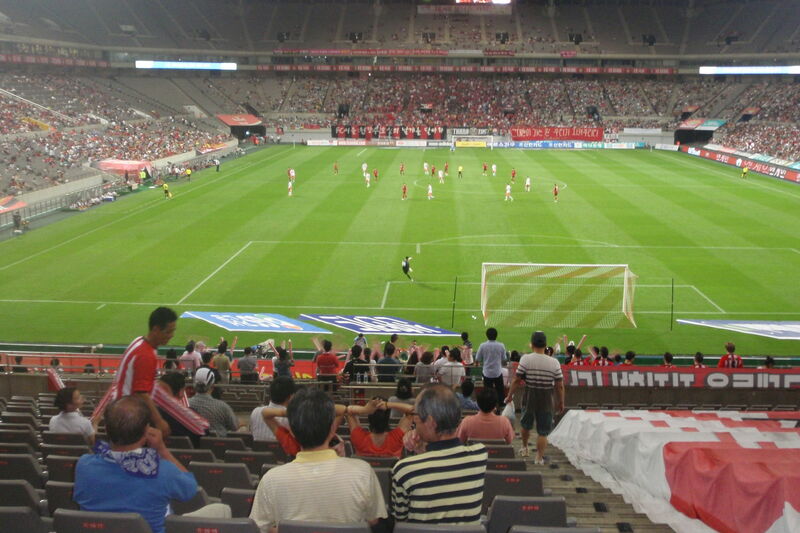 The second half started badly for Busan with Changwon winning a penalty a few minutes after the restart. I’m not sure if it was deserved or not as I was concentrating more on the beer and the frogs, but Song Geun Soo tucked it away to put Changwon a goal up. And in truth, I can’t remember much more about the second half action. 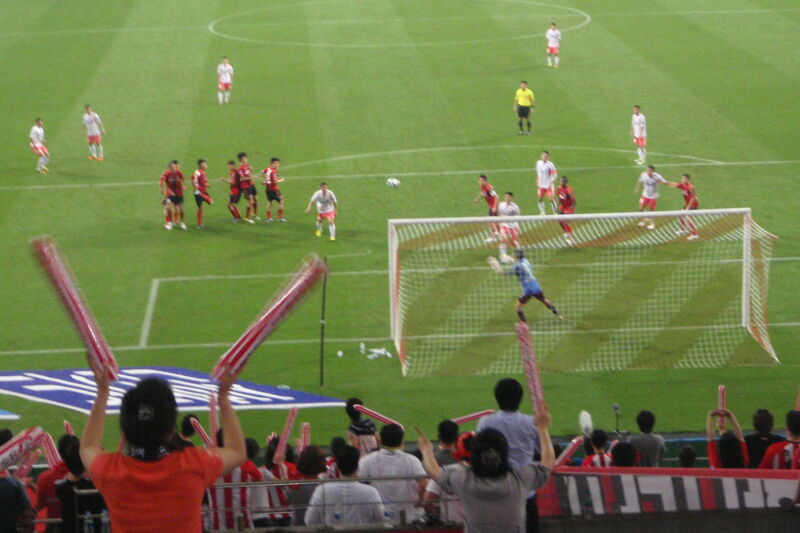 We sang a bit and gave the Changwon goalie plenty of stick but I don‘t think Busan came too close to scoring. Or maybe they did. Changwon didn’t get any more though and so the penalty was the difference between the teams at full time.